Again the inspiration for this creation was the need to use up pantry items nearing expiration. It's funny how the idea of having to throw out food gets me to come up with some great ideas! I had a reduced fat prepared graham cracker crust and frozen peaches in dire need of attention. With a little tender loving care, I created a delicious and decadent "semi" homemade pie. I don't think I've ever made just a plain peach pie before. I've always added blueberries and made my own crust. 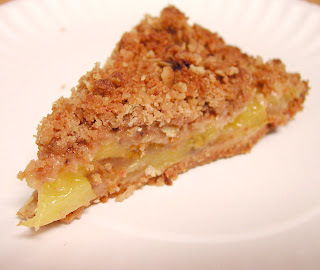 In this case I figured the prepared graham crust would be a good complement to the peaches and the crumb topping really added an extra richness. Speaking of richness, this a fairly rich pie. I did however, reduce the fat by using half the amount of butter than in traditional crumbles. I also cut the sugar. Don't worry it was absolutely fabulous! You can cut a lot of extra fat and calories without even noticing the difference in flavor. Brush pie crust with egg white and bake for 5 minutes. Set aside to cool. If using frozen sliced peaches, spread them out on a cookie sheet to thaw and cut each slice in half to make them about 1/4" thick. In a medium bowl, place peaches, 1/4 cup sugar, tapioca and salt. Stir and let stand for 15 minutes. In the meanwhile prepare the crumble topping. Mix flour, oatmeal, brown sugar, butter, and spices with a fork until it resembles coarse bread crumbs. 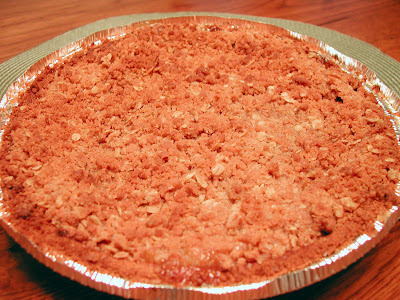 Place peaches in the prepared crust and top with the crumb mixture. Place on top of a foil lined bake sheet. Bake in preheated 375 degree oven for about 50-55 minutes or until topping is golden and peaches are bubbling and tender. Brilliant! Such a good idea. I love that you used oats in the crumble part. I find most of my cooking ideas comes from using up leftovers. Don't know if you still update your blog, but this is awesome, just what I was looking for. Thanks!